New arrivals for April - new ice cream sculpt, Ben & Jerry's, rainbow pancakes and more! Welcome to Littlest Sweet Shop! Sorry for the delay. I was actually expecting a new outfit for my doll which was shipped from Japan on April 5th but for some reason it still hasn't arrived yet! I wanted Maya to show the scale of these new miniatures in her new outfit but I think that will have to be delayed until next month (when I eventually come back from holiday). This is still a long post even though there are no dolls featured since there are many new and updated items throughout the whole sweet shop. I did promise to keep working on making more new grocery items so here is the latest one! There are now 6 new tubs of ice cream and they all have different graphics. I am a modeller, not an illustrator so you can imagine something which should be so simple to make took me a week just to design. I am still not great at using Illustrator but I am not giving up so I will continue to make more new packaging designs in miniature. The lid is made from clay but everything else is quite durable and fits together nicely so you can take the lid off to reveal the delicious ice cream inside! Of course you can also have your tub with maybe half ice cream left (for your greedy doll) or a few scoops taken out. Like most of Littlest Sweet Shop groceries, this one has an English print on the front and Japanese print on the back. Each flavour is unique and we are planning to come up with more new flavours in the future! Ben & Jerry's is my favourite ice cream because I just love their packaging design so I was keen to make a spoof version that had to be equally cute. Rainbow Pancakes is our something new in the Breakfast menu. Since it is a stack of brightly coloured pancakes, this particular product comes with everything you see here as a standard. You will get 6 layers of pancake, a knob of butter on top with drizzling maple syrup and a dollop of whipped cream. The 100s and 1000s sprinkles is the cherry on top. Some new tableware have been added and the first one is a donburi or Japanese bowl. Of course I have plans to fill them up with delicious Japanese style food like ramen or gyudon when I actually have the time! Just expect to see some Japanese donburi cuisine at Littlest Sweet Shop in the upcoming months. When I looked at the list of tableware that we produced, I thought that we should have a dinner plate since that is probably the most basic tableware that most people/dolls should have. Now we offer dinner plates in 1:6 scale so you can order your miniature food with a matching dinner plate. Since it is handmade just like everything in our tableware collection, you are free to choose the colour of your plates. Littlest Sweet Shop tableware is handmade and if you have 2 or more of the same one you can even stack them! Time to debut some new chocolate since we have produced so many new sweets in the past months. These 2 new items are available via the chocolate pick'n mix in our Sweets Boutique. Feel free to mix and match flavours (milk chocolate, dark chocolate, strawberry, white chocolate) or have just 1 type of flavour - the choice is yours! Fancy having some really kawaii cakes? These Tomodachi cakes are just too cute in the likeness of Rilakkuma and friends. They are domed shape cakes coated in confectionery icing and decorated in detail. Each cake will serve 1 doll and completes a kawaii tea party. Macarons are always popular in miniature but since I was doing a YouTube tutorial on how to make macarons, I decided to create a stripey designed one as an extra challenge for my viewers. These are still the standard macaron size but with pastel stripes and a white cream filling. Crumbly detail on the side just like real ones! We like to make people smile when they look at our miniatures and colourful ones can definitely put a smile on any face! 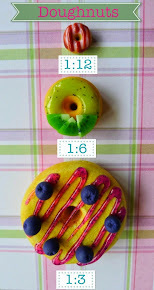 Rainbow Bread slices has just been added to our rainbow-themed miniatures. Each slice looks soft and fluffy with bright colours. For the past 6 years since starting Littlest Sweet Shop, I have been expanding my skills and evolving to produce miniatures that will also reflect my style. Part of evolving is creating a better version of something that has already been made. As time moves on and as I gain new tools, materials and techniques, I will always try to improve a current miniature whenever I can. Fast forward to 6 years later and there is a new ice cream cone sculpt! We have sold so many ice cream cones in the past and appreciate everyone who loves them but now if you commission 1:6 scale ice cream cones, it will be made with an improved cone in uniform size. You can also commission a stand that can hold up to 4 ice cream cones. The 1:6 scale ice cream cones come in small or large sizes just like at the ice cream parlour. The small one is suitable for kids or a doll who is trying to be on a diet and the large one is for any ice cream fan. All you need to do is pick your cone size and have any flavour scoop added on top. Choose 1 or 3 or even 6 scoops! We also make any flavour ice cream so request your dream scoop. This Drumstick-style ice cream looks so delicious and irresistible. Comes in our new signature small cone and coated in thick chocolate and chunky nuts. The ice cream underneath the thick chocolate shell is vanilla, just like the Drumstick. Our next update is for cupcakes. After 5 years of making cupcakes, there is now an improved sculpt for 2018 onwards. The cupcake base itself has sharper corners and definition. The diameter on the base is slightly smaller than the top. It still comes with the original style paper liner and now available in 2 sizes, normal and large (for both 1:6 and 1:12 scale). This is probably the fourth update that I have made on the croissant and this time there is not 1, but 2 new types of croissants. Somehow I don't think this will be the last update because croissants are one of those type of miniatures which you can spend your whole lifetime trying to make perfect. This time the croissant has a semi-gloss effect where the shading with more flaky looking pastry. The pain au chocolat has also been updated this time around. Powdered sugar is optional. Finally our last update is the chocolate chip cookies. Ordering Littlest Sweet Shop chocolate chip cookies is so easy! First choose milk, dark or rainbow chips then decide if you want it with nuts. So that is all of the new and updated miniatures available for commission when I eventually come back from holiday! I will also be stocking up more miniatures on the Etsy store in June to make it easier for you to purchase our miniatures directly online. Just because Littlest Sweet Shop isn't open in May doesn't mean there won't be any posts and tutorial videos. I am Sculpey's blogger of the month for May so there will be an exclusive project available via Sculpey.com. I will also be posting on their blog about my polymer clay adventures so make sure you follow them on social media to not miss out. I will also add the links here when it is posted. In other news, we reached 30k followers on Instagram and I couldn't be more happier! It is never easy to record yourself modelling miniatures so I am glad that the hard work is paying off. It's also a fun platform to share bits from my daily life. There will be a lot of cool new things to debut this weekend however commissions are closed until June 2018. The Etsy store is also closed for now but you can always buy miniature sets from Tiny Frock Shop. You get everything on the table including a plate and 1 ice cream stand. There are so many varieties of ice cream cones and there is even an ice cream cake! This set is perfect for summer and will feed many dolls. If you were thinking about opening your own Candy Store, this set will be a good place to start. There are so many tiny pieces of handmade sweets and even a large gumball machine to decorate a small sweet shop. A selection of our signature cakes with something for everyone. Comes with a cat shaped plate. Cupcakes are colourful and fun but you also get elegant chocolate dome cakes. Perhaps you prefer to have a large set of pastries instead so your dolls can have endless tea parties in the garden during the summer. Re-stock your miniature kitchen with these delicious food. Your dolls can snack on the various goodies like ice cream and doughnuts. Celebrate not just one but several different events with this exclusive set. There are miniatures for Halloween and even Christmas. Our Etsy store will be closed next week so place your orders by end of this week or you will have to wait until the store re-opens back in June. Commissions are still closed for now but remember that you can still request a quote from me and I will try to get back to you ASAP even when I am away on holiday. Still lots to do before I am on vacation for a whole month (May) so expect a new YouTube tutorial video and brand new miniatures by next week.